NEW YORK—(ENEWSPF)—June 6, 2017. The New York Times published on Monday an investigative report that found that drug overdose deaths last year reached an all-time high, suggesting that the country’s long-term opioid crisis continues to worsen and that younger age groups in the U.S. are experiencing record numbers of opioid overdoses than in the past. The Times looked at preliminary overdose data for 2016 provided by hundreds of state and local health authorities, concluding: “Drug overdoses are now the leading cause of death among Americans under 50, and all evidence suggests the problem has continued to worsen in 2017.” The report estimates that more than 59,000 people died from a drug overdose in 2016 – an increase of 19% from 2015. The report does not elaborate on which drugs are behind the estimated jump in overdose deaths last year, nor does the report indicate which age groups under 50 saw the largest increase in overdose deaths over prior years. Advocates have criticized President Trump and his administration for failing to deliver on his promise of increased access to opioid treatment, as well as for backing health care legislation in Congress and proposing major cuts to Medicaid that cumulatively would make devastating cuts to opioid treatment and mental health services for populations hit hard by the opioid crisis. “President Trump and his administration talk about expanding access to opioid treatment and ending the opioid crisis but are taking very aggressive steps to do just the opposite. Trump continues to push for a health care bill that threatens opioid treatment access for millions of people who otherwise can’t afford it. Trump’s first budget to Congress puts more money behind law enforcement than treatment, and actually proposes to cut treatment funding levels over what President Obama proposed in his last budget to Congress. It’s really difficult to take seriously Trump’s assurances it’s prioritizing a response to the opioid crisis with this track record,” said Grant Smith, deputy director of national affairs with the Drug Policy Alliance. The Drug Policy Alliance recently released a plan to address increasing rates of opioid use and overdose. The plan marks a radical departure from the punitive responses that characterize much of U.S. drug policy and instead focuses on scientifically proven harm reduction and public health interventions that can improve treatment outcomes and reduce the negative consequences of opioid misuse, such as transmission of infectious diseases and overdose. Increase Access to Effective Drug Treatment: There is wide consensus among experts that medical best practice requires that an individual struggling with opioid use disorder should have access to the full spectrum of behavioral, pharmacological, and psychosocial treatments. Lift Barriers to Medication-Assisted Treatment: Medication-assisted treatment (MAT) refers to the treatment of opioid use disorder through the prescription of medications such as methadone and buprenorphine, which block the effects of opioid use and prevent or relieve withdrawal symptoms and cravings. Scientific research has established that MAT is a cost-effective intervention that increases patient retention in treatment and decreases drug use, transmission of infectious diseases, and criminal activity. However, a number of known federal barriers prevent MAT from being as widely accessible as it should be. The federal government needs to increase access to methadone and make it available in more health care settings. Congress should also repeal a federal law that caps the number of opioid patients a physician can treat with buprenorphine at any one time. Establish Safe Drug Consumption Services: Safe Drug Consumption Services, also known as supervised injection facilities (SIFs), are controlled health care settings where people can consume drugs under clinical supervision and receive health care, counseling, and referrals to health and social services. SIFs have been rigorously studied and found to reduce the spread of infectious disease, overdose deaths, and improperly discarded injection equipment, and to increase public order, access to drug treatment and other services, and to save taxpayer money. Five states have introduced bills that would authorize SIFs, including Massachusetts, Maine, Vermont, California and Maryland, and a number of municipalities have considered implementation of SIFs. Research Heroin-Assisted Treatment: Heroin Assisted Treatment (HAT) is a form of medical care that involves the carefully regulated and controlled administration of pharmaceutical-grade heroin to people who have failed other drug treatments. Research has shown that HAT can reduce drug use, overdose deaths, infectious disease, and crime, while saving money and promoting social integration. Utilize Drug Checking as an Overdose Prevention Strategy: To reduce the number of hospitalizations and fatal overdoses related to adulterated heroin or opioid products, DPA recommends that federal, state and local officials investigate ways to make greater use of technology that tests opioids and other drugs for adulterants using GC/MS analysis or other highly accurate methods. Adulterated substances lead to higher numbers of hospitalizations and fatal overdoses. Although some types of testing, such a reagent testing or metabolite strip testing, are available to the public, health authorities could improve the surveillance of fentanyl and other opioid analogues, and community programs that serve at-risk populations could better help people avoid adulterated drugs, with the use of high-level technology. 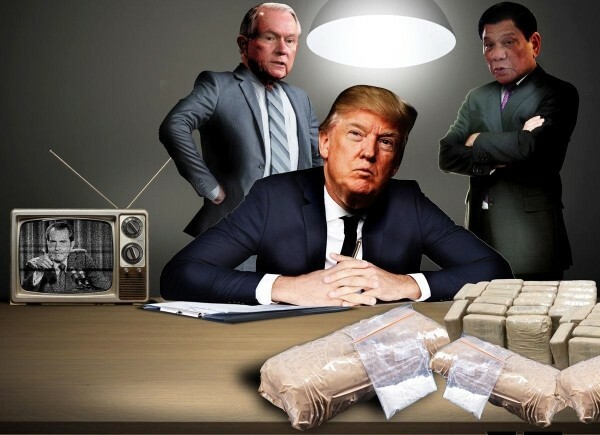 President Trump seems to believe the only way America can win a war on drugs is to put up a wall.